Fiberglass wax: Why you are not asking the right questions?! See what the Expert has to teach you! The truth is, the best fiberglass wax is not really the question most people should be asking. As a professional with over 20+ years of first hand experience, I know what works and what doesn't. One thing I have learned along the way is that many people lack enough understanding to be asking the right questions. Many myths exist when it comes to wax products. Fueled by an industry looking to sell the ignorant consumer base more and more products, we are constantly being mislead and confused through marketing and advertising. Even as a professional with years of experience, I find myself having to "read through" the advertising and marketing to see what I am really getting, or to verify that I am getting what I think I am getting. What is the difference between car wax and synthetic sealants? Do you really need to wax your boat or RV? What if your boat or RV has some oxidation? Q. - Darren, do we really need to wax our boats and RV's? A. Yes. At least if you want to maintain the beauty and value of these toys. Just like car paint, the elements of weather will degrade and "weather" your toys. Every material will degrade as a result of the aging and weathering process. Each material needs protection, and choosing the correct or most appropriate form of protection will be required. Choosing the right fiberglass wax and applying on a consistent basis is priority one when it comes to fiberglass and gel coats. Q. - I have always heard that natural carnauba products are best. A. First off, the "best" of anything will always depend on the exact benefits you are looking for. When it comes to choosing the best in a fiberglass wax, usually people are referring to durability or longevity of protection. Boats and RV's take up substantial real estate, so care and maintenance comes at a significant cost of time and labor. Naturally people are going to look for something that will allow them to wax less often, rather than more often; and size is just the starting point even before we get into the weather elements these "toys" of ours must endure. 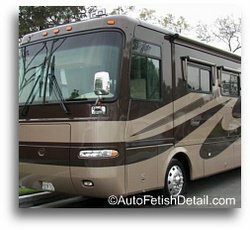 While natural carnauba based products have the reputation of visual enhancement and beauty, RV and boat owners generally require protection as their first priority. Q. - What is the difference between natural and synthetic products? A. Natural products will be blended using natural ingredients such as beeswax, carnauba wax, etc., and will usually be labeled as a wax product. There really is no limit to the many forms of natural ingredients a manufacturer can use to create a natural, wax based product. Synthetic polymer products will be chemically engineered using only synthetic ingredients, and should be labeled as a sealant. Noticed I said should, as there are still many manufacturers which still continue to label their synthetic products as a wax or polish. This is not only incorrect, but adds to an already confused consumer base. We can add further confusion when we discuss the hybrid blends of both natural and synthetic ingredients. These hybrid blends represent the winning combination of benefits based on the latest advancements in chemical science and engineering. Q. 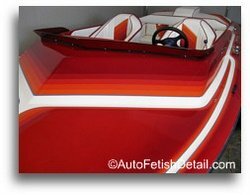 - What if my boat or RV already has some level of oxidation to the fiberglass or gel coat? A. You are not alone. Depending on the level of neglect, oxidation is a common problem for many. And depending on this level of oxidation, you have a few options. For mild to moderate cases of fiberglass oxidation, you can use a cleaner wax and combine 2 steps into one; remove oxidation while applying some form of protection at the same time. For moderate to severe cases of gel coat or fiberglass oxidation, removing the oxidation before applying protection will be required. Below I lay out my specific recommendations based on professional experience. Just Show Us What Works Darren! Let's go through the different situations of boat and RV care when it comes to choosing the best fiberglass wax or fiberglass sealant, as well as dealing with the different levels of oxidation. Darren's Note: When it comes to waxing, polishing, or compounding anything, and I mean anything. It doesn't matter what the label says about using by hand or machine. The only reason manufacturers put it on labels now is to play "follow the leader" with their competition (if everyone else does it, then certainly we must do it). But I can take any product and produce results regardless if I use it by hand or machine. I can simply finesse the moment based on the "information" I am getting fed to me as I use a product and see what kind of results I am getting. This is a completely different debate as to whether using a machine or using hand application is either better or more appropriate. Point is; don't get hung up on whether the packaging says use by hand or machine. It is dependent on you and you can choose either when you first start out. 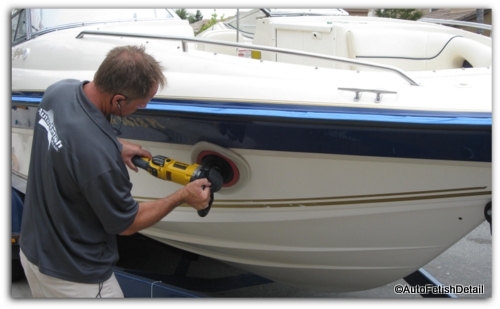 If your boat is in excellent condition (as in literally brand new) I have the following recommendations that will meet your needs of protection and visual enhancement. Just know that if there is any form of oxidation to your boat, you will likely be less than satisfied with your results unless you choose a cleaner wax from below, or even one of the more aggressive compounds from below. Gel coat is very different than car paint as far as the oxidation process goes and the manner in which you treat it. An excellent wax that can be used on any of your toys; not just as a fiberglass wax. For use on boats and RV's in excellent condition. Gel coat/fiberglass is literally like trying to wax your bathtub. Same material, same process of manufacturing. Gel coat/fiberglass oxidizes very differently than 2 stage car paint. Gel coat/fiberglass will become chalky. 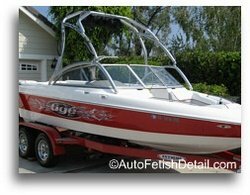 The tricky part is that even if your boat still has shine to it, in 99% of the cases it will also have some level of oxidation that you will not realize until you try and wax it. For this reason I always recommend that a person start with a cleaner wax like the two below. 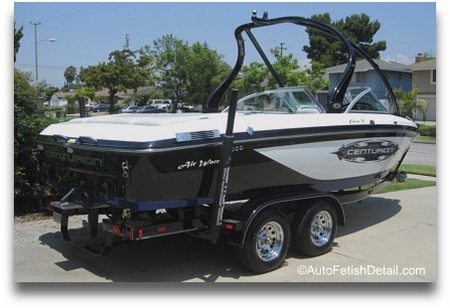 Just because it is a cleaner wax should not alarm you if you are waxing your boat or RV for the first time and you think it is in pristine condition. You will be completely safe in suing one of these cleaner waxes. If you are dealing with mild to moderate levels of fiberglass or gel coat oxidation, then a cleaner wax is effective if you are looking to simplify your world from 2 steps, into 1 step. Meguiar's M-5016 Boat/RV Cleaner Wax - Liquid, 16 oz. Ideal for any boat regardless of how perfect you think it is. Ideal for anyone unsure as to exactly where to start. Can be used as many times as you want if you realize you have more oxidation than you realized until you achieve desired results (or your arm grows tired first of the repeat applications. A trusted name in automotive and marine appearance products. Will produce pretty much the same results as the Meguiar's above. The choice will be more about which brand you trust most.I am confident in recommending any of the brands on this page based on what you determine is the best "version" of fiberglass wax according to my guidelines I have laid out on this page. When using any of the products above, I recommend applying with a damp micro-fiber cloth using heavy handed pressure, as you will literally be doing hand polishing. Back and forth or circular strokes is acceptable. Remove using a dry micro-fiber cloth. Repeat with your applications as many times as necessary to achieve desired results. For many of you, this could literally be more than two applications for each section. You are safe and you will likely be surprised at how much oxidation reveals itself as you begin to work. The satisfaction is intoxicating as your bring more and more shine to your boat or RV as you work. One thing my decades of experience has taught be about people who go looking for fiberglass wax, and boat owners in general, is that most boat owners or RV owners don't actually understand the true nature of gel coat. And specifically when it comes to waxing fiberglass or gel coat that has begun to oxidize. And more importantly experience has taught me that most people are deceived by the initial appearance of their boat or RV since the eye will interpret any level of shine as their boat or RV being "not too bad". 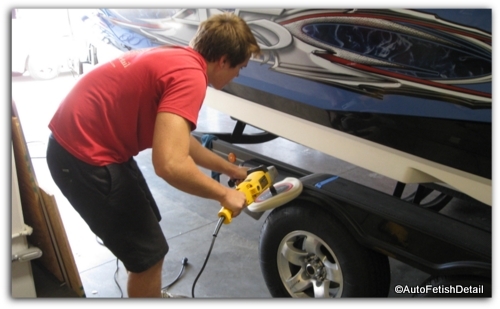 Here my 16 year old son is using the Dewalt high-speed polisher to polish the fender on this boat trailer. It was literally his first time behind a buffer. As in; "My boat isn't too badly oxidized", or "There are only certain parts of my boat or RV that seem to be oxidized"
It is only when they go to start waxing their boat or RV that the rude reality almost instantly sets in. Or after they have completed a section of waxing that they stand back and examine in different angles of lighting where the unevenness of their efforts now reveals itself. This is due to the nature of gel coat and how it oxidizes at uneven rates therefore making it very difficult to create a truly perfect, uniform appearance if attempting to polish or wax your boat by hand...even if you think you have found the best fiberglass wax! For this reason I add the below section for those of you committed to taking your boat or RV to the best level of shine with your own efforts. If you are looking to take your boat or RV to the highest level, then machine polishing will be the next step. The good news is that due to the latest generation of soft-start polishers, they are ultra safe as you remain in complete control. Variable speed triggers with soft-start. Gel coat/fiberglass is extremely durable and tough. Unlike car paint with much softer clear coat, it would be extremely hard to mess up your boat with even one of these "scary" high-speed polishers. Once you do the heavy lifting of polishing your boat or RV with one of these quality polishing kits, then you can use the best fiberglass wax of your choosing. There are many bad opinions and bad recommendations. What I can tell you is that mine come from first hand, professional experience. Many misinformed people will tell you what the "best" fiberglass wax is, or that fiberglass and gel coats are much more sensitive than car paint. Despite what you may have been told by the inexperienced, gel coats and fiberglass are much more durable than car paint; this both represents the good news and the bad news. Using the Dewalt high-speed polisher to remove heavy layers of oxidation from the fiberglass hull before I apply some of the "best" fiberglass wax. Because gel coat and fiberglass is such a durable and tough material, when it comes to polishing and removing oxidation, it requires more product and more work. The heat and friction required to remove advanced layers of oxidation are only possible through the use of a high speed polisher and wool pads. The good news of this is that polishing on these tough and durable materials of fiberglass and gel coats means they are also much more forgiving when it comes to the possibility of damage during use of the high speed polisher. So if you are a beginner, and have been sitting on the fence as to whether or not you want learn how to use a high speed polisher, it would be next to impossible to do any form of actual damage. The great thing about the particular polishers above, are the ability to dial them down to such a low operating speed of only 600 RPM's. With the either of the 2 kits above, you also get the options of selecting either foam pads or wool pads. So the less experience you have, which might be no experience, you can start slow, and work your way up to greater and greater results by selecting the perfect combination of polishes, polish pads, and speed settings based on your skill set. You can also further your results by using the polisher and foam pad to apply your choice in fiberglass wax or sealant. You really have the greatest amount of versatility with the above kits. Interesting how many topics that appear simple at first, can become rather complex subjects. Our discussion on fiberglass wax is no exception. I hope through our discussion on selecting a fiberglass wax has left you both informed and empowered to make an informed decision!